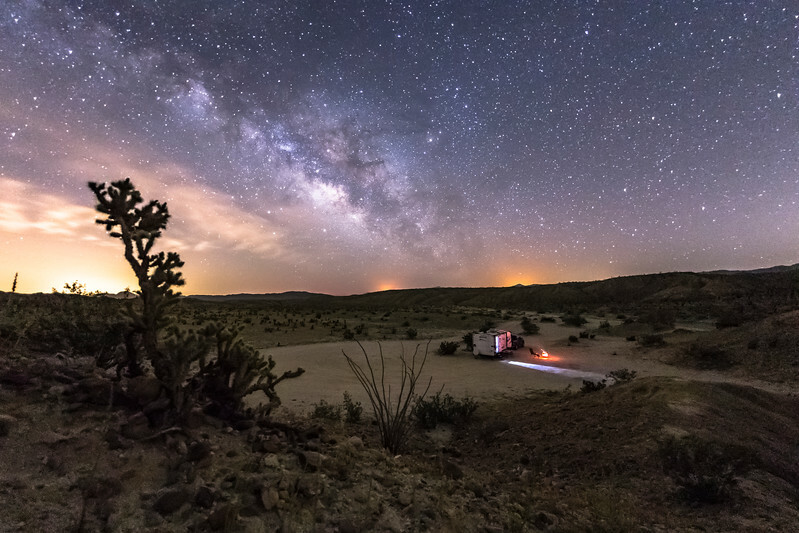 Camping/boondocking in my trailer under the Milky Way in Anza-Borrego Desert State Park. Shot with a Canon 6D and Sigma 15mm EX DG at 25 sec f/2.8 ISO 3200. This is an area in the southern part of the park known as Hollywood & Vine due to a street sign bearing those names that was placed on a hill in the area. The sign has been stolen and replaced several times over the decades. When I first got here yesterday afternoon, there were VERY strong winds - as high as 37 MPH! Dust and sand were blowing everywhere. I didn't think I would get a chance to shoot last night as the forecast called for strong winds until 3:00 PM today. All of a sudden, around 1:00 AM, the winds died down to almost nothing. I was in luck! I hiked up a nearby hill, set up my camera and timer, and shot a time lapse four a little less than four hours. Here is one of about 500 frames in the sequence.